This probably isn’t that interesting to most other people in the world, but it is to me since I live in Worcster, MA and I love hearing about clean energy making progress. It’s something that just makes sense and we’d be foolish not to embrace it. 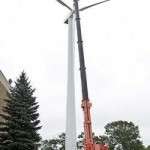 Anyway, Holy Name Central Catholic Junior Senior High School did the research and actually followed through on building a 262 foot high wind turbine on their campus here in the city. You can just barely see it pop above the tree line as you drive down 290 west bound through the city. I saw it the other day and couldn’t believe what I was seeing right in my own back yard. I’d be lying if I didn’t say I was excited to see it. What I find particularly exciting about this is that Worcester is known for its weather. We get all sorts of weather patterns coming through the city because of its central location in Massachusetts. We always seem to at least have a slight breeze all times of the year. It gets especially windy in the Spring, Fall, and Winter. So this type of renewable energy in our city makes total sense. I’d like to see more of these pop up around the city. They don’t look ugly if you ask me, and with the abundant wind resource we have here, it makes perfect sense to help power the city. This entry was posted in Environment, Renewable Energy, Technology, Worcester and tagged Renewable Energy, Wind Power, Worcester, Worcester MA on October 2, 2008 by bill.